Why do my students confuse the Berlin Blockade with the construction of the Berlin Wall? Actually I think a more useful question to ask is why I, as a teacher, don’t confuse the two. Of course it helps that my knowledge of history ensures the word ‘blockade’ means more to me than simply a barrier. More significantly I’m not capable of confusing the two because I know each is rooted in a different set of complex events. I know that the wall was built to solve Khrushchev’s problems due to refugees and mounting tension with Kennedy, especially after the U2 spy plane incident. For me that can’t possibly be confused with Stalin’s blockade to outmanoeuvre the other Allies at a time when Germany had not yet even been formally divided into GDR and FDR. Appreciating this helped me explain why our Edexcel International GCSE students performed relatively poorly on their Paper 1 last summer. This paper has a brief chronology question. Students simply have to put events in order. They are then asked one effect of an event on superpower relations and the causes of another event from the course. Our students followed the general trend on this paper, scoring worst on the first simple question that only required them to put events in order. I felt this widespread failure in an ostensibly easy task was indicative of a deeper problem. I began to wonder if our students did not have a decent sense of the flow of events and the complex interrelationship between those events. They had learnt and revised each event in isolation but they had a weak grasp of ‘the story’ – they could not draw upon an internalised narrative to put events in order. This would also explain why they struggled to come up with causes and effects of events named in exam questions unless they were obvious ones which had been identified in advance by the teacher and specifically taught. To check if my suspicions had some foundation in late September I set this task to the new Year 11 who had nearly completed the Superpowers topic. I listed a series of events on a page with an empty box between each event. I asked the class to use the blank boxes to explain how the previous event led to the next on the list. My goodness they hated this task! It was interesting just how much they struggled, even with a textbook available to fill in those blanks. Sometimes they had learnt some causes of named events but not necessarily the necessary details to link that event back to the previous one listed on the sheet. Even when they had vague notions they found it really hard to articulate these into a causal explanation. This was fascinating (but also more than a tad depressing). Perhaps I had just done a bad job with my teaching but I suspect many GCSE students would find this task hard. I would argue this is because in our teaching too often we downplay narrative in favour of emphasising analysis and this is counterproductive. If you teach a class the causes of an event they learn ‘some analysis’. They are not equipped ‘to analyse’ those events. In the exam my students struggled with some questions because it was impossible to revise developed explanations in advance for the vast range of possible cause and effect questions that could come up. To be able to nail the ‘events in order’ question and cope with any named cause or effect would require students to have a grasp of the complex web of events for themselves. Such a student could spontaneously think of causes and effects of events even if these had not been specifically identified in advance by the teacher. I am not saying it is wrong for a teacher to identify causes for students but that we must be aware that they are not practising ‘analysis’ when they regurgitate this shopping list of factors, even if they have a decent understanding of what they are writing about. Of course, I had referenced more complex causes as I explained each event to my students – I had never thought that was unimportant. However, I had to admit to myself that I had not been as successful as I had previously thought! I have realised that students struggle to realise just how one event leads to another when events are taught in a confusing order. (Many of my students were actually unaware that the textbook does not explain the events in order. This discovery was a bit of a shock to me!) For example, the students needed to appreciate how the ongoing take-over of Eastern Europe by Stalin influenced Churchill in 1946 when he wrote his Iron Curtain speech but that takeover then continued, explaining the Truman Doctrine and the decision to send Marshall Aid. However, although my class did know what the ‘Iron Curtain’ was referring to, the students had been taught the ‘The Soviet Takeover of Eastern Europe’ as a discrete topic after the Marshall Plan (following the format of the board textbook). This year, with my year 10, I have changed this and taught the unfolding story. It has been tricky to plan but worth it. I have paused at the end of key events in 1945, 1946, 1947, 1948 and 1949 and taken time to set a proper written question about reasons for growing tension that requires students to draw upon all the events so far. I did, sort of, do this before but it has become central. I have set starters at least once a week in which the students have to put events into order that they have studied so far. When we go over these I have pushed students to explain back to me (where relevant) why it makes sense for one identified event to follow the previous one on the list. On Wednesday my Year 10 had a whole class debate and I was chuffed. I felt that there was evidence of much better ongoing acquisition of knowledge than in previous years. There was much more confident use of events to justify arguments, even in the heat of discussion. I will be curious to see how this class perform in their summer exam. I currently think they are shaping up nicely! I don’t think I taught the Superpowers topic badly in past. Rather I think this topic, by being particularly problematic, highlights a common weakness in history teaching. How well do we help students to build a complex narrative rather than just helping them learn some causal explanations? SAT retakes in Year 7. Oh please no! So the Conservatives have won the election and we must wait and see how vigorously they will implement their manifesto pledges. As the exit polls were announced on election evening I was with a secondary English teacher friend. She is totally unimpressed that Conservatives have said that children will be expected to retake SATS in year 7 if they don’t reach the required standard in year 6. The details of requirements are not clear but I sympathised with my friend. Who wouldn’t? Trudging through all the dreary preparation necessary to pass those darned things is hardly the best use of remedial time in year 7. It is an appalling idea, a time consuming distraction. After all there are pretty simple and quick tests of progress in literacy and numeracy that can do the job perfectly well. However, before we get right on our high horses let’s pause a minute and look at it from the politicians’ perspective. They want to ensure the weakest students get the help they need to progress in the most fundamental areas. Politicians asked the education establishment to produce tests which will check students’ numeracy and literacy. It might be very naïve of the politicians but why on earth should they doubt that SATS do what they say on the tin? If the sort of tasks set in SATs are the only way to test numeracy and literacy progress then surely that is what all secondary teachers are doing anyway? After all they must surely be tracking the progress in literacy and numeracy of their weakest students. If preparing for SATs style tasks is not necessary to either aid or monitor progress then why are they being used in the first place at KS2? Anger seems directed against politicians for wanting to ensure kids make progress but it is clearly at least partly misdirected. Rather than getting angry at naïve (but actually probably well meaning) politicians why aren’t we directing our anger at tests that are so poor that one has to teach to the test at the expense of actually learning numeracy and literacy? If we accept that some form of external tracking of progress is going to happen, why aren’t we directing our energies towards trying to make it better? Rather than screaming venom at rather hapless, naïve politicians, why aren’t we asking questions about why so many modern tests and exams seem to require enormous amounts of teaching to the test? This is a very big issue with so many exams from KS1 to A level. A secondary history HoD told me recently she spends 40% of the GCSE time training students to pass the exam. Another told me that it then made no appreciable difference to student’s performance at A level whether they had done the GCSE with all that training or skipped most of it by doing the IGCSE! Obviously some of our assumptions about effective assessment are wrong. Why aren’t we using our professionalism to work out better forms of testing? Why aren’t we being more critical of the tests we have? Why are we blaming politicians while offering no alternatives? It is much better to come to decision makers with an alternative solution than to appear to want to duck accountability. If SATs are wrong for KS3 then why do we think they are any better at KS2? Let’s start asking questions about what really works. Let’s start seeking better answers. Let’s be professionals! I am still quite stunned by the difference it made to my children helping them with maths at home. My children are currently aged 12, 10 and 7. I began when my eldest daughter was in Year 1. Having seen the rather dramatic difference it made offering regular and systematic help I began to also work with my younger children at home. Whatever your child’s ‘natural’ ability in maths it is perfectly possible for them to excel when compared to standard expectations. People often ask me for advice about helping their own children so I thought I would share my experiences of teaching my son from age 2. When he was two I bought my son a few nice picture books to teach recognition of numbers. 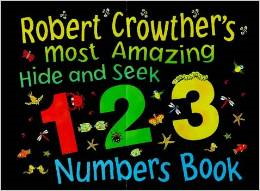 Robert Crowther does a number book as well as an alphabet one. There was a marked difference in the speed with which my children learnt numbers but it is best not to introduce too many at once. I just focused on numbers 1-3, then 1-5 and finally, after quite some time, 1-10 until my son recognised those with real confidence. Some children will remember numbers from a bit of incidental chat as it occurs each day but not my children. To build memory it was crucial to look at the numbers most evenings. When my son was only two I would simply trace my finger around the number shape and say its name ‘two’ and then count out the ‘two’ items illustrated on the page. It took a minute or so every evening and initially I didn’t expect my son to join in. Meanwhile… I did lots of counting with my son. I remember thinking my eldest was ‘not good at maths’ because all her pre-school friends could count to 10 and she couldn’t. I now realise it was silly waiting for something to happen ‘naturally’ that was clearly a taught skill. We should have just counted more regularly with her than we did. Therefore, with my son I always counted up to 10 before turning off the light at night and ensured I counted with him numerous times every day. I’m stating the obvious but it wasn’t obvious to me with my first child. It is really important that as well as learning the numbers by rote you count items out. You want to isolate the relationship you are trying to present so use different items. This helped my son realise the numbers represent quantity of any item. We counted up the stairs, we counted out plates, at tea time etc etc. What was crucial was that we did so everyday, numerous times a day. When he was counting a number of items reliably I began asking him to count out a number which I specified in advance. This meant remembering the number which tells you when to stop. Once my son recognised numbers 1-5 I put those numbers onto cards and started getting him to put the cards in order as he counted. We did this after tea every day – for about a year (it seemed that long anyway!) We gradually worked up to 30 and would line them up in tens. He didn’t always want to and I did make up stories in which he was a super-hero and would save the world only if he could get the numbers in order! I did insist my son did his number work but realised that generally if my child was becoming very resistant to working it was probably because I had made it too hard and I needed to go back a few stages and ensure most of what he did was easy. The really crucial concept for my son to understand was ‘one more’. It seems obvious but it SO isn’t for a young kid. You can ask for one more shoe or for them to pass you one more spoon. I used the cards once my son had laid them out each evening. I would point to the number 2 and ask ‘what comes after two?’ Once he was quite confident with this I would start with 9 and work backwards asking what comes after nine? Then what comes after 8? I would ask the same questions with lego bricks, placing another brick down each time we counted ‘one more’. After a while (you have to be very patient and try and appreciate how new these ideas are for a young child) he got the idea that when counting, ‘one more’ means ‘the next number’. Once he had got this idea really sorted (and not before) I explained simple sums to him on paper e.g. 2+1 etc. I again used blocks and other household items to show what the sum represented. We soon worked up to having sums asking what one more was for all the numbers up to 20. I stopped using the cards in order every evening and would do those sums instead. By that time he was really confident counting to twenty (and then thirty) and so at night I started counting backwards from ten to one every night before turning the light out. (ready to help kick off the idea of ‘one less’.) I was never in a hurry, I was content for it to take many weeks or months for him to learn the next thing. I had twin goals. I wanted my son to understand how numbers work and I also wanted him to become fluent in using numbers. Understanding isn’t all or nothing and often developed after fluency, proficiency allowing my son to appreciate a pattern as he was not overwhelmed simply calculating. I both wanted my son to understand how to work out a calculation but also to begin to know those ‘sums’ without thought, automatically. Therefore I would give my son the same calculations to do everyday so that he reached the stage where he could have done them in his sleep, he was so automatic! I then began to introduce calculations of ‘two more’ and then ‘one less’. The next big hurdle was ‘counting on’. If presented with 3+2 a child will initially count up to three and then count two more to reach the answer. A child needs to learn to start at the number 3 and simply count two more (probably on their fingers/lego to begin with). Teaching this took enormous patience and lots of modelling. Simultaneously I was now beginning to work on ‘number bonds’ with my child. He needed to know, without having to calculate, the different ways of making ten, 10+0, 9+1, 8+2 etc. I taught him to be able to fill in any one of the three numbers in the sum if it was missing . Once I started to teach him number bonds he did some practice everyday, to build up memory and then continued to practice number bonds long, long after they were apparently known. I taught doubles and moved onto adding 3 and 4. My goal was that anything committed to memory had to be known in the same way a child knows their own name, entirely effortlessly and with no risk they will forget. This is the first page of an early exercise book. (BTW in case you are wondering the purple pictures are aeroplanes, there was a long aeroplane drawing phase! )The same calculations were done every day – gradually adding in more. By the end of this exercise book my son was doing about 50 calculations a day but hadn’t dropped any of these. This investment in the early stages I have outlined is invaluable. The next big step, ‘place value’ (this means understanding that the value a digit has depends on whether it is in the place for ones, tens, hundreds etc) is fascinatingly to teach. A child can appear to understand that 13 is one ten and three ones but not apply that knowledge in any other context. If you are interested in where to go next with you child look at the National Curriculum which sets out clearly what needs to be taught at each stage. All that I have described is well known to any primary teacher and so it is worth explaining why it led to my children becoming advanced in their maths. My son went to school with rock solid foundations in place, he was not reliant on the teaching in his school. In schools the focus on understanding is too frequently at the expense of fluency. The focus in my son’s reception class was on learning in authentic environments. The intention was good but elaborate learning contexts or responding to the maths as it arises through play makes it hard to build learning systematically given that maths is relentlessly hierarchical. Such contexts can mean the child is distracted from the key learning intention of the activity and they get little practice for fluency as each activity is very time consuming. 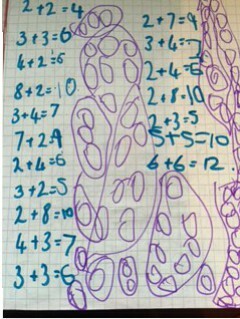 My son might do a handful of calculations a day at school. He would come home and do fifty, by year one he was quickly managing over 100 calculations at home . The extra focus on fluency and automaticity gave my son firm foundations as all subsiduary steps could be done without thought, leaving my son free to focus on the one new thing being learnt. The real secret to all of this is very regular practice or the child forgets. I’d be one of those annoying smug type of people if I try and pretend my kids always wanted to do this work. I have been very dogged but it has really paid off. People assume requiring children to do work at home will put them off maths when it had the opposite effect. It actually made my children enjoy school maths because it was easy. Maths is tough when you don’t have the fluency and automaticity. Try long division or multiplying fractions when you are not fluent in your tables! I could have left my children to discover maths was ‘hard’ at school, like it had been for me. Instead I made it easy for them. I have already outlined some useful general tips and in my next post I will talk about how I taught reading. Over the next few posts I am going to explain how I helped my third and youngest child with reading and maths before he started school. I was enormously naive with child number one and presumed she had a fixed ability in numeracy and literacy. I made no special effort to teach my child before she started school and when her Reception teacher told me she was stronger with words than numbers I nodded acceptingly. Of course, she inherited my leaning towards the humanities! However, in Year One, it was clear my daughter’s maths was relatively weak. I realised she would struggle at the local 7+ prep school where we had a fee discount and need weekly remedial maths. I could have been angry that this prep school would consider such a young child as ‘behind’ and rejected that school for judging my daughter at a young age. However, I now realise such loving sentiments actually sell your child short, presuming it is they that have the problem. While children undoubtedly vary in ability virtually ALL are perfectly capable of ‘excelling’ at maths with the right teaching. My experiences teaching maths to my own children made it clear to me how children in Hong Kong can be 21 months ahead of their English peers aged 5. The stunning ability of some very young children in maths now seems more the result of parental choice than natural precociousness. I absolutely don’t think parents should feel an obligation to do formal work at home with their children but I do what to share my experiences with those interested. I didn’t choose for my young children’s lives to be dominated by maths. However, I have taught them enough to ensure they are all very strong mathematicians who find school maths easy – and thus quite fun. The story of how I came to help my children is here. I also explain my reasons for doing extra teaching with my children at home here and here. It surprises me how often people ask me for advice on how they should help their own children with numeracy and literacy and I hope these posts will help. I also want to have a record for myself as it is amazing how fast you forget when your children move past each phase. I intend these to be working documents I edit as I remember extra details and in the light of any good advice/corrections. I don’t claim to be an expert – these are my tips, from my own experience. Make of them what you will! In this first post I want to outline some general useful principles I have learned for anyone wanting to help their child in reading or maths. It is easier to teach your child if you have a regular routine. After a little initial novelty it is unlikely a child will want to sit down and work every day and you will soon run out of fun and exciting ideas that tempt your child by their novelty and fun. Doing your work at a fixed time each day means it will soon become a habit, an accepted part of the daily routine. When beginning a new routine make sure work is quite easy and rewarding and very gradually increase the demand. Don’t make work difficult. Much should be repetition of very familiar material so that your child gains fluency and automaticity. If they are becoming very resistant to working it may well be that you need to make the work easier. Have you jumped ahead too fast? This is such a tricky and fascinating question. I know many parents are terrified of requiring children to do work when it goes against their inclination. They fear the child will be put off. All I can say is that motivation can also come from a sense of self efficacy. If your child begins to find maths hard at school then all that effort and strain to motivate though fun will be lost in a blink off an eye. My children didn’t always want to do the work I gave them but school maths is easy and thus enjoyable. I do offer rewards for doing dull tasks such as learning tables but I have always been careful to withdraw these as soon as possible, using them to get over a ‘hump’ but never as a permanent fixture. You want your child to learn new knowledge systematically. If a task seems too difficult it can probably be broken down into a series of smaller steps. Ensure only one small part of a task is unfamiliar or tricky. It is important not to move on to new material until what has been covered is known so well a child can give the answer like they would their own name. This means lots of real ‘overlearning’ of ideas. For example, I think my son was given the calculation 4+3 for two years, most days, in some form or another. Don’t focus on one topic for a period of time, to the exclusion of others. You want to build understanding but what is most challenging is to ensure something the child has understood – is learnt – stuck – forever – in memory. Therefore ensure that most of each day’s work is practice of previously learnt material. As something becomes more familiar you can cycle it less frequently and ultimately it will be practised as part of more complex operations. Never underestimate a humans ability to forget what seems well learnt! This is never linear. It seems to generally involve nearly as much regression as progression. I have found that the point when I despair of my child ever learning the thing I thought they had learnt months ago, they are probably very close to really ‘getting it’. As the saying goes, ‘ It is always darkest just before dawn’! Break something down into smaller steps whenever you can but hang on in there! Remember that for a child learning something in one context means they will only be able to do that thing in that one limited context (and they many forget even that). It is your job to introduce the new learning in a gradually expanding range of contexts. What seems like perverse forgetfulness really isn’t. Patiently re-explain. Remember that this is all about building memory. You can’t do this if you don’t revisit material regularly as part of a routine. If you want to support your child it needs to be most days or they will not remember previous work. Explain clearly but work towards practice being independent. If you leap in with prompts and help they will not be able to do the work unsupported. If it is too challenging go back a few steps or break the task down but aim to quickly have your child doing the work set by themselves. Don’t bother with most of the commercial products available in WH Smith. At best they can guide you as to what is taught at school but your child needs literally hundreds of times more practice than those books provide. 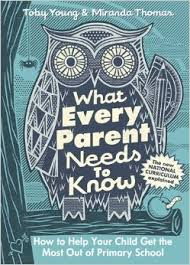 In ‘What Every Parent Needs to Know’ Toby Young and Miranda Thomas have created a year by year breakdown of the new primary National Curriculum. It includes what your child will be taught in every subject and why. What they’re expected to know at the end of each year and the test they will take. In my next posts I will outline specific ways I helped my pre-school son with maths and reading.